TimeSlice provides a complete ecosystem for your horse show and association requirements. Our horse show software lineup is comprised of three primary systems, HSS, HorseShowsOnline, and MAPS. These products are integrated with each other to provide a robust system that can easily share data. An additional software package HSSremote can extend HSS to provide ingate and announcer status and to immediately publish entry and ring status to the web at HorseShowsOnline. HSS show management software is the core application used to manage horse shows. 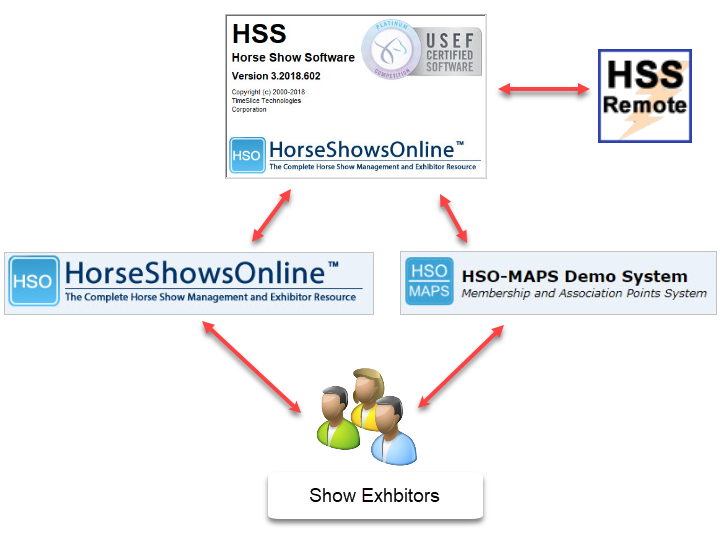 HSS is deeply integrated with HorseShowsOnline to publish show information to the web and to process online entries. MAPS provides equine associations (EG: Hunter Jumper associations) with membership and points computation / ranking. The family of horse show products provide all the necessary resources for show managers, show exhibitors, and associations and their members. Download HSS and read more at the HSS software site. The diagram below illustrates the relationship between the different products in the show software family. HSS - At its core is the HSS show software. HSS is used to manage the show, on-site at the facility. HSS can publish and exchange information with HorseShowsOnline, sending results and acquiring online entries from exhibitors. HorseShowsOnline - Exhibitors can visit HorseShowsOnline on the web using any web conneced device to view results, show information, schedules, and to submit online entries, orders, and add/scratch requests. HSSremote - Show management, ingate personnel, and announcers can use HSSremote to view and record real-time status of entries as the show progresses. HSSremote via HSS will publish the latest information to HorseShowsOnline for exhibitors to view. MAPS - Associations that want to acquire show results for their members in order to generate points totals and rankings can use MAPS to import show information reported by a show into their MAPS association database. HSS horse show software has been used by horse shows for over 20 years in the United States and Canada. HSS provides all the features necessary for managing a horse show - people and horse records, show entrie records, invoicing, prize money check writing, points computation, online entry, credit card processing, web publishing, results reporting and more. Whether you have a show that has 50 entries or 2000 entries, HSS provides all the features you need including online entry and credit card processing. All HSS shows integrate with HorseShowsOnline allowing you to publish your show and its results to the web. HSS provides unsurpassed technical support. Show software is a mission critical component of your show. The availability of technical support is a critical part of your software decision. You can rely on TimeSlice to provide support and assistance whenever you need it including after hours and weekends. HSS has been certified at Platinum level by USEF. You can rest assured that HSS has been rigourously tested by USEF to ensure all the necessary features are incorporated to insure you success at the show and to properly integrate and report results to USEF. Ask other HSS users about the level of support they have received and compare that to other software vendors. We're confident you will find we are well ahead of the competition not just with the quality of HSS, but the level of support show secretaries receive. We monitor email and telephone lines 7 days a week and even respond to support requests after hours. We will help you whether you have a question about how to accomplish a task, setup your show, or are having problems with your computer equipment or network. This is all part of the service provided with your HSS licence. The leading horse show management program used throughout North America. HSS is used by thousands of horse shows. Platinum certified by USEF, United States Equestrian Federation. Fully integrated with USEF system for lookups and results posting. Recognized by EC, Equestrian Canada. HSS integrates with the EC live system for exhibitor validations and results posting. Extremely well suited to Hunter, Jumper, Equitation and Dressage shows. Publish show information, class results, ring schedules to the web. Supports online entry - exhibitors can submit their entries on the web to your show. Online entry forms are automatically generated and populated with exhibitor information and imported into your show - no manual data entry required! Product orders - exhibitors can submit feed, bedding and other product orders to your show via the web. Credit card processing - let exhibitors pay for their horse show entry using credit cards at entry time and directly at the show at checkout time. Fully integrated with MAPS, the Membership and Association Points system used for managing association memberships and points reporting and ranking. Extremely powerful report engine and report export capability. You can view thousands of shows that have published their show at HorseShowsOnline. 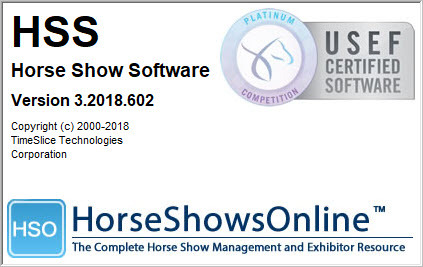 HorseShowsOnline was the first horse show related web site to provide integration with horse show software, providing up to date results and show information. HorseShowsOnline has serviced over 20 million visitors. HorseShowsOnline directly integrates with HSS show software used to manage horse shows onsite. Show secretaries use HSS to run a horse show, record exhibitors, schedule classes, process invoices, credit card payments, issue prize money, generate reports and more. The show secretary has the additional ability to publish the horse show information and results to HorseShowsOnline enabling exhibitors to enter the show using the online entry system and to view rider, trainer, horse results during and after the show. Show secretaries have tools and reports available at HorseShowsOnline to help manage the show. Online entry for a show is extremely simple to setup. Simply turn on the online entry option, set a few dates and agreement text and then publish the show. HSS and HorseShowsOnline automatically create all the necessary entry forms and optionally process credit cards as online entries are submitted by exhibitors. Credit card processing is entiresly optional, but most shows utilize this feature to improve cash flow and to streamline the checkout process. Advertising opportunities at HorseShowsOnline - publicize your show, equine products, and services. HorseShowsOnline provides an excellent opportunity to advertise a horse show as well as other products relevant to horse shows in general. If you have products or services relevant to people in the equine community placing an advertisment on HorseShowsOnline is an excellent way to reach your audience. HSO receives thousands of visitors per day providing excellent exposure for your product and servivce. Great for real estate, horse services, feed, bedding, accomodation and more! HSSremote is an extension program that works with HSS at the horse show. HSSremote provides complete support for Ingate, Announcer, VIP tent display, Instant messaging, scoreboard export, and Real-Time ring status updates to the Web. Ingate staff and announcers can use the HSS remote application to monitor and update the status of entries in each ring at the show. As entries enter and leave the ring the updates are immediately displayed on the web at HorseShowsOnline and at each HSSremote display at the show. Let your exhibitors track the ring status for your show at using HSSremote and HorseShowsOnline. HSSremote is optimized for use with touch screens and small inexpensive tablet devices. Computing and reporting points and rankings based on how members have peformed at horse shows. Computing points is a difficult process to manage given the variety of points rules, multiple horse shows, and special rules that must be applied. Many associations try to do this with spreadsheets, but this is an enormous amount of work and prone to errors. MAPS solves this by providing a robust and flexible points computation engine. MAPS provides the solution - an Association using MAPS can keep track of users along with membership renewals. To track points for members and horses, MAPS provides the tools to let you import show results from HorseShowsOnline or from standard USEF results files generated by any horse show software. Simply import a horse show's results into your MAPS system, review the data and instantly generate points reports and rankings. MAPS provides numerous tools to adjust points after importing show results to allow fine tuning points and rankings if necessary. Completely web based - no need to install any software. Use MAPS on a PC, MAC or iOS device. Compute points and rankings for the entire association. Flexible points computing engine allows you to adjust points for various classes and divisions easily. You can even override and adjust points for a single class result! DIrectly import shows and results from HorseShowsOnline into your MAPS database. Directly import USEF results files into your MAPS database. Generate email list for bulk email to association members. This is great for sending membership renewal requests or sending bulk notifications to members. Easily merge duplicate people and horses. Import USEF sections or EC classes directly from USEF and EC to help setup your MAPS points divisions. Each association gets their own website dedicated to MAPS. Members can browse to the association's website to obtain the most current points rankings.